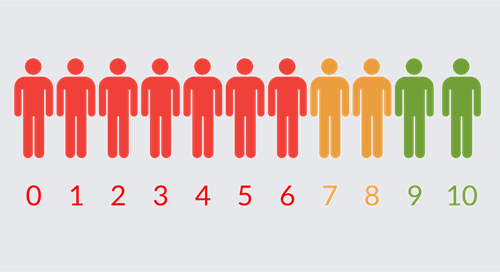 The Net Promoter Score (NPS) is a simple but powerful metric used to measure guest satisfaction with one question. Created by Bain & Company, NPS is an emotion-based question that asks customers to rate on a scale of 0-10, “How likely are you to recommend this business to a friend or colleague?” It’s a great internal indicator of how your hotel is doing. Guests are asked to rate one question on a scale of 0-10: “How likely are you to recommend this business to a friend or colleague?” Based on his or her response, each guest is classified as a promoter, passive or detractor. Within the Revinate dashboard, detractors, passives, and promoters represent highly actionable opportunities for your hotel marketing efforts. For example, with Revinate Surveys™, you can download your list of detractors and do service recover. It’s a good idea to send them an email, apologize for their mediocre or poor experience, and ask them what happened. Passives are a great opportunity to create promoters. You can reach out to them and find out what was missing. What could have taken their hotel stay from “Good” to “Incredible”? Promoters are a great group to engage with. They’re often your biggest fans on social media, and they’ll be the loyal guests who come back again and again and choose to stay at your hotel over a competitor. It’s a good idea to create segments of guests with your email marketing automation and CRM platform so that you can specifically target your detractors, passives, and promoters. For example, you can set up a recurring campaign to send to all promoters after checkout, encouraging them to follow you on Facebook for news and updates. You can also set up a recurring message for detractors that apologizes and encourages guests who weren’t totally thrilled with their experience to reach out to your General Manager. But NPS isn’t just about reaching out to guests. You can also see trends over time, which can help you make decisions during budget season. Within the Revinate dashboard, you can see correlations between NPS and the questions on your survey. So for example, you can see if there is a correlation between NPS and your fixed questions like room, sleep quality, and service. You can also create custom questions to measure areas of your choosing against NPS. Our hotel customers often choose to ask about areas like the check-in experience and wi-fi (On a side note, we’ve found that mentions of wi-fi have a strong negative correlation with review score. While we encourage all hotels to collect and analyze their online review data, it’s important to gather as much data as possible to measure the success of your hotel. NPS is a great way to see trends over time and reach out to groups of guests to build those valuable relationships that create lifelong customers. I am very pleased to be in contact with your blog. Thank you very much for your kind cooperation. Park Inn by Radisson Cankaya, Ankara will have an opening in early 2016. We are looking forward to receving remarkable tips from your blog. Your support is very important for us.